Recently Closed Docks: this command opens the list of the docks you have closed recently. You can reopen them by clicking on their name. Please note that isolated windows are not concerned. 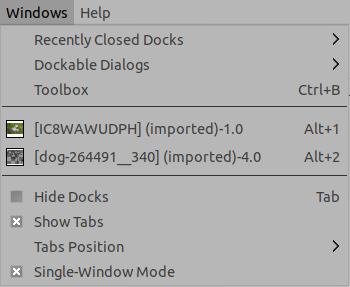 For more information about docks, please see Dialogs and Docking. Dockable Dialogs: this command opens the list of dockable dialogs. Please refer to Section 2.3, “Dialogs and Docking”. Toolbox: clicking on this command or using the Ctrl+B shortcut, raises the toolbox usually together with the tool options dock. The list of open image windows: clicking on an image name, or using the Alt+Number of the image shortcut, makes the image active. The list of open docks: in this list, docks are named with the name of the active dialog in this dock. Clicking on a dock name raises this dock. 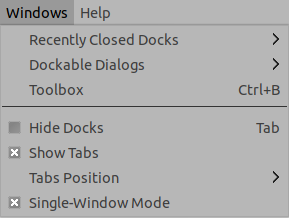 Hide Docks (Tab): this command hides all docks (usually to the left and right of the image), leaving the image window alone. The command status is kept on quitting GIMP; then, GIMP starts with no dock in multi-window mode, but not in single-window mode, although the option is checked! Single Window Mode: when enabled, GIMP is in a single window mode. Please see Single Window Mode.